A team of scientists exploring the deep depths of the ocean discover more than they bargained for when they encounter a megalodon, a giant species of shark thought to be extinct. The Meg does take a while to find its feet. There’s a lot of characters to introduce, almost too many to keep track of or care about, which takes time but once ex-deep-sea diver Jonas Taylor (Jason Statham) arrives things step up a gear. The first half of The Meg is more of a claustrophobic thriller as researchers are trapped at the bottom of the ocean with something attacking their vessel, the second half is more of the fun, action-packed people vs giant shark film you were probably expecting. Naturally the scenes filmed on boats are a combination of filming in a giant tank with green screen, and being on the actual ocean, and the computer wizardry meshes those two together really well, so you really believe these characters are either going to swim or be eaten. The special effects are also great on the shark, it feels like a real intimidating presence and when a character gets a bit close to its jaws you get worried. The film really thrives whenever Jason Statham is on screen. 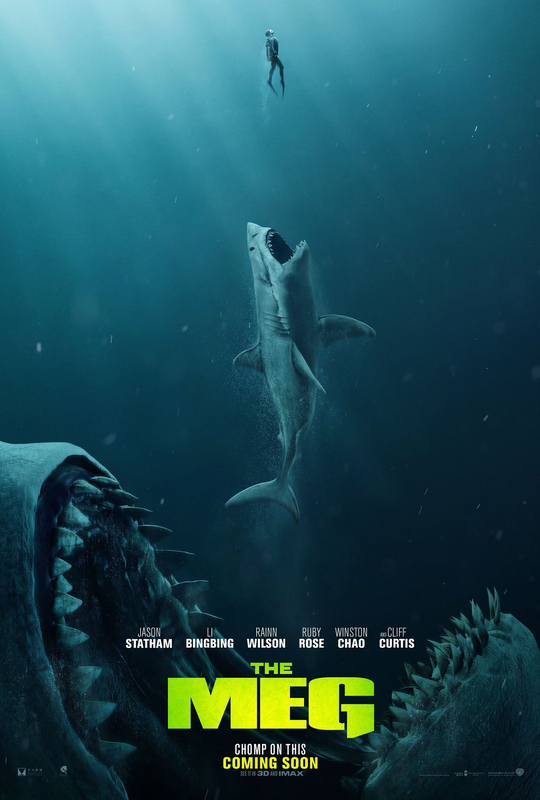 The Meg was pitched as Jason Statham vs a giant shark and it certainly delivers that, eventually that is. The action sequences whenever anyone is in the water are tense and while there are a lot of people for the Meg to chomp on, not that many people get eaten. The Meg doesn’t really go in for the blood and gore, which in certain sequences is a shame and makes the deaths somewhat samey and almost dull, but it’s a film that knows exactly what it is and relishes in it. The Meg does try for more serious and emotional moments and they don’t always hit the mark. That’s not down to the cast, who all look like they are having a great time and do a great job even with some of the cheesy dialogue, but is more down to the pacing and the film trying to overstretch itself beyond the monster movie it is. I will give The Meg its due for having a more internationally diverse cast than you usually see in a Hollywood film of its ilk, and it has not one but three smart female characters who are all scientist of some description. In the case of Li Bingbing’s Suyin, she is almost a co-lead with Statham and does just as much as him when it comes to saving the day. The Meg is a lot of fun. There are jokes sprinkled throughout, a lot of which land, and the film generally knows what it is and has fun with that. There are a few typical tropes, for instance the greedy billionaire, but it makes them work. 4/5. I have a Letterboxd account and it’s pretty great. Letterboxd is the movie version of Goodreads so you can log what you watch, write reviews, make lists and follow different users. If you get a Pro account (which is only $19 a year which is about £15 and I think that’s pretty good value to be honest) you get to see what your various movie-related stats are each year you log films and overall on all the films you’ve ever marked as watched. 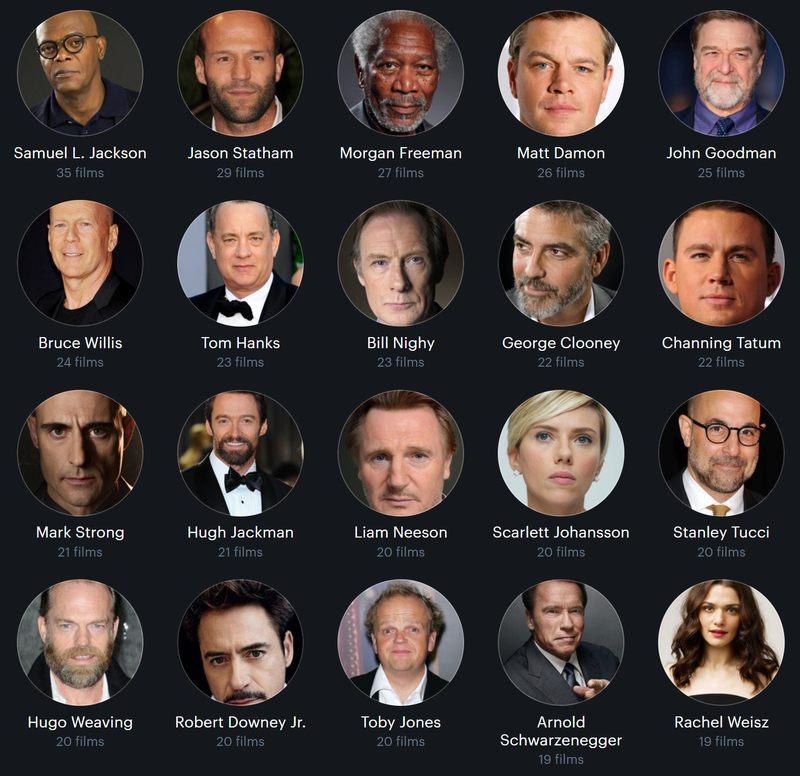 I’ve been looking at which actors I’ve watched the most overall and there’s some interesting things there but it does make me want to try and change some of my viewing habits. When Dominic Toretto (Vin Diesel) is seduced into the world of terrorism by the mysterious Cipher (Charlize Theron), his family and crew must join with old foes in order to stop him. Fast & Furious 8 really steps it up a gear in terms of stunts and spectacle. There’s car chases on the streets of New York, a giant wrecking ball taking out cars and, of course, a submarine vs cars on ice sequence. They shouldn’t work and sometimes it’s a little chaotic to follow where everyone is but it’s best to let the adrenalin start pumping and go along for the ride. Cipher is a very different kind of villain to what the crew has faced before. She’s almost all seeing and all-knowing thanks to her hacking skills and is powerful enough to get Dom to turn on his family for her. Most of her scenes are with Dom so it would’ve been nice to see her interact with more of the characters and see how characters like loud-mouth Roman (Tyrese Gibson) would react her. It’s weird going into a Fast and Furious film without Paul Walker being there and they do have a reason why he and Jordana Brewster are not in the film, but the film generally still holds up with the old crew and a few new additions. There’s Eric (Scott Eastwood) Mr. Nobody’s (Kurt Russell) new protégée, who takes a while to gel and Deckard Shaw (Jason Statham) is roped in to join the team. The conflict between him and the team is a bit hit and miss, the film quickly brushes off his history with the team (they almost killed his brother and he in turn killed one of their own and tried to kill the rest of them in the last film) and it would’ve been nice to see some more of that conflict. The one place you do feel that tension is between Shaw and Luke Hobbs (Dwayne Johnson), their chemistry is great and there’s a lot of humour from them two trash talking each other. Each member of the team has their moment to shine but in many ways, this is Dom’s film. He has the emotional beats of the film, along with (to a lesser extent) Letty (Michelle Rodriguez). She, as his wife, is the most visibly torn up about his betrayal and while she does have some cringey lines, she gives a good performance. What can I say, if you’ve seen any of the recent Fast and Furious films then you know what you’ll be getting into – a world where the laws of physics don’t apply and the main crew of street racers are more like spies or superheroes nowadays. 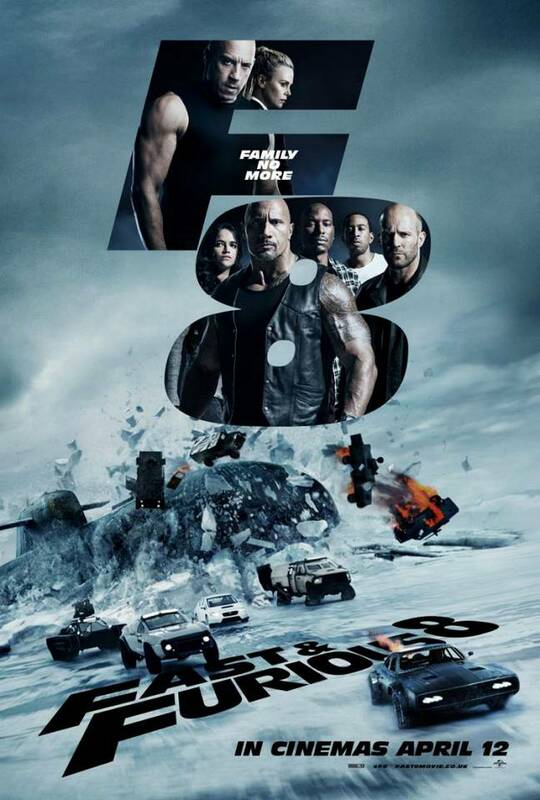 Fast & Furious 8 continues to be a lot of fun with a thrilling finale and a lot of laughs all the way through the film – it’s mad but it works. 4/5. Deckard Shaw (Jason Statham) seeks revenge on Dominic Toretto (Vin Diesel), Brian O’Conner (Paul Walker) and their family for what happened to his brother in London. In order to find Shaw before he finds them, they help government agent Mr. Nobody (Kurt Russell) rescue a hacker and their device that can locate anyone on the planet. If you know what the Fast & Furious franchise is about, you’ll know what to expect from this film. There’s the ridiculously amazing car stunts, the great team/ family dynamics and there will be some girls in skimpy outfits. It’s over the top and brilliant. All the stunts and fight scenes are incredible and the trailer really just teases them. The sequence where the cars drop out of the plane goes on a lot longer and it’s a sequence that just keeps on giving. The various fight scenes are also great – I especially liked the one between Letty (Michelle Rodriguez) and Kara (Ronda Rousey). Statham is a great addition to the Fast & Furious franchise. He is a threatening presence throughout the whole film and always manages to show up and cause problems for the team when they’re least expecting it. His character’s introduction is truly brilliant, you don’t see him do much in the way of violence but it definitely establishes him as a force to be reckoned with. Like the previous films in the franchise, in Fast & Furious 7 each character has their time to shine. Whether that’s Roman (Tyresse Gibson) crashing a party and making it incredibly awkward, Tej (Ludacris) hacking into a high security penthouse or Hobbs (Dwayne Johnson) with a huge machine gun. It was great seeing so many of these characters who do feel like a family back together again. Obviously production on Fast & Furious 7 was put on hold due to the tragic death of Paul Walker. You can tell that rewrites had to happen because in a sense it feels like two films, one with Deckard Shaw as the main bad guy and one with the secret government agent Mr. Nobody, that have been pushed into one big film. This means that some plot threads don’t always work and it would have been nice to fully concentrate on one aspect of the film but with what they had, they have made another action-packed, funny and thrilling film. Fast & Furious 7 is a bit bittersweet really, especially if you’re a big fan of the franchise and its characters. It gives a wonderful tribute to Paul Walker and the character of Brian O’Conner that will leave just about anyone chocked up. It’s a fitting end to the film, and (possibly though probably not due to how much money it’s set to make) to the franchise as a whole. 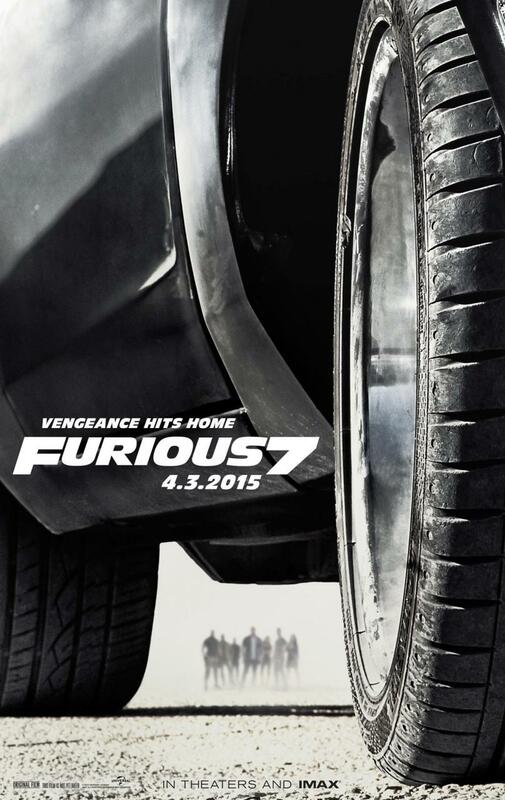 Fast & Furious 7 is big, bold and a lot of fun and is possibly even better than the last film. 4/5. I am far and away more of an action girl than a rom-com girl, and Jason Statham happened to be in some of my favourite action movies. So without further ado here are my favourite films featuring Mr Jason Statham. As I’ve said before, I think this might be my favourite Statham movie. Statham’s a detective on the trail of a cop killer and is partnered with Paddy Considine’s Nash and together they make one of my favourite duos. It isn’t necessarily good cop-bad cop. Considine is morally ambiguous, and while Statham doesn’t always follow the rules he does the wrong things for the right reasons. Bl itz is about Brant (Jason Statham), a hard detective and his morally ambiguous counter-part Nash (Paddy Considine) trying to catch a serial killer (Aidan Gillen) who is targeting police officers. In some ways it should be quite a generic movie. Statham is in the role of the detective that uses his fists rather than his words and who doesn’t pay attention to the rules. You’d think Considine’s character would be the good cop to Statham’s bad cop but really he is a morally ambiguous character, who may want to do what Brant does but doesn’t quite have the guts. That being said Blitz does what it does very well, interesting characters and great performances raise this film up from its typical B-Movie status. As mentioned before Brant and Nash are interesting characters – they’re an odd couple in a way. Nash is gay and gets a lot of hassle from the other members of the police force but not from Brant – one or two homophobic comments at the start of their working relationship aside, Brandt has no problems with this and they work well as a team. Aidan Gillen makes an amazing yet frightening villain. He really is crazy and you don’t quite know what he’s going to do next. How he plays against Statham and Considine is brilliant and perfect. The side character of Falls (Zawe Ashton) a female police officer that Brandt looks out for is a great character. How she deals with being a potential target for the serial killer is great and she is very real and relatable. Interesting characters coupled with great action sequences leads to a film that is far better than one might expect. It has a tense finale that fits the narrative well and a great soundtrack. I just really enjoy this film a lot – in a strange way it’s kind of a “comfort movie” for me – if you like Jason Statham, buddy cop dynamics and a fair bit of violence, definitely give Blitz a go.